Mesquite first golf course maintains its reputation among the finest golfing experiences in the area. From the front side surrounded by water to the back nine built among the arroyos and canyons, you'll enjoy the richness of the course and the surrounding beauty of the desert and mountains. This is a tough starting hole that doglegs to the right. A slight depression lies in front of the green. Palm trees and a fairway bunker at the corner of the dogleg right will challenge your tee shot. Challenges are abundant all the way down this hole. The lake on the left and the fairway bunker on the right demand that you keep the ball in the fairway. A well-guarded green results from the bunkers on both sides. A fairly straight-forward par 3. The lake on the left shouldn't come into play but the sand trap on the right side of the green often does! From tee to green, you'll know why this is the number one handicap hole on the Palms golf course. You have quite a large pond halfway down the fairway on the right and fairway bunkers on the left. The slightly elevated green is surrounded by two bunkers. Even though there is a pond on the right side of the fairway, you shouldn't have much trouble with it. You will need to watch out for the fairway bunker on the left. There is a gentle slope into a slightly elevated green that catches short approaches. Aim left away from the water on your right but not too far or you'll hit the bunker. A heavily bunkered green requires a very accurate second shot. A fun par 3 over the water to a tiered green. Hopefully you won't be looking at the swans and koi too closely. From the elevated men's tee, you'll be hitting over water and a clump of trees on the left side of the fairway, both of which are easily cleared with a good shot. Trying to cut the corner on the dogleg left will cause the fairway bunker to come into play. The women's tee at the bottom of the hill makes it a little easier for the ladies. Bunkers front and back of the green gobble up misjudged approaches. This dogleg left might be the toughest hole on the course! Long hitters might consider cutting the corner, however most should steer clear, leaving a long approach to the green. After making the turn you'll swear you're on a different course. You'll face a deep ravine directly in front of the tee box with a blind shot down the fairway. Once you crest the hill, you'll see the dogleg left into the green. Be careful not to overshoot the green and find the sand trap in the back. The main challenge on this hole is choosing the proper club. From the elevated tee boxes, you'll look out over the countryside and into the southern mountain range. Have fun and swing away! It's all uphill on this hole. The bunkers you see in the picture below are hidden from sight on the men's tee boxes and you'll certainly want to avoid them. The elevated green usually hides the hole so you'll have to aim for the stick. Wise players will choose accuracy over distance off the tee. The bunker and desert on the left will cause lots of problems if you don't. The green is protected on the right front by a deep bunker. You'll be enjoying great views from the tee box and green as long as you clear the canyon on this dangerous par 3. The Palms signature hole lives up to its reputation for sheer beauty and fun. 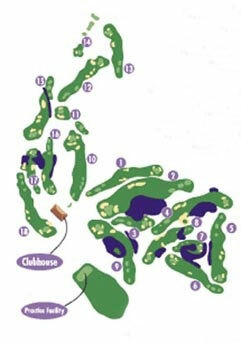 From the elevated men's tees 114 feet above the fairway, try hitting the middle of the fairway for a great second shot. The elevated green has a narrow opening with bunkers front left and right. Many players avoid a driver on this hole, choosing to stay to the right off the tee box. Hit to the right corner of the dogleg for a clear shot into the green. You'll need to be careful of the canal running the entire length on the left side. From the elevated tees you can clearly see all the trouble that lies ahead. Leave your driver in the bag and you'll have an easy shot into the green that has a slight slope front to back. You won't see the green until you get to the top of the hill on this hole. It plays much longer than the yardage indicates. You do have a wide fairway so hit away. The green is protected on both the left and right sides and the back. It's a great finishing hole that will have you signing up to play another round.